Jumpmasters OBX camp takes fun to new heights! 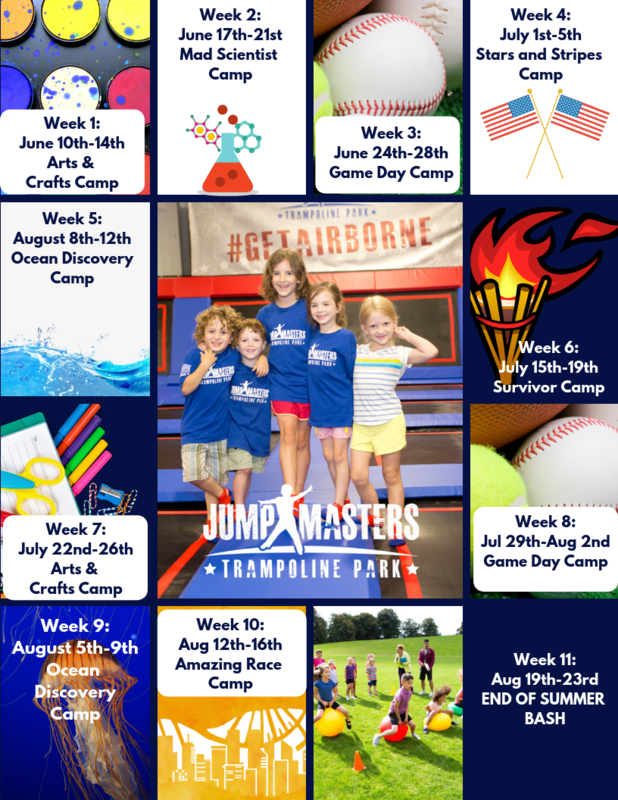 As a result, campers will compete in a variety of physical activities such as Jousting, Dodgeball, Kickball, Ninja Warrior Races, Relay races, and trampoline games. Above all they will spend time jumping as well as doing a variety of STEM and creative activities throughout the day. 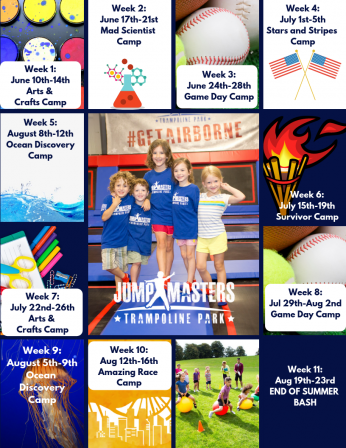 Most of all, at Jumpmasters Summer Camps, we’re on a mission on the Outer Banks to get kids excited and empowered by physical activity so they build a foundation at camp and stay active for the rest of their lives. Even more we have an amazing crew of wonderful, skilled staff just waiting for a camp adventures together. We provide out-of-classroom learning experiences to develop socialization, cooperation and other intangible life skills. 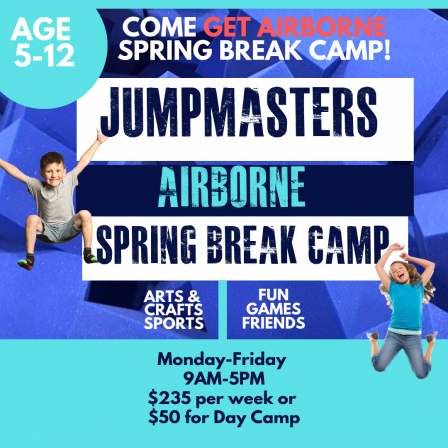 TAKE ADVANTAGE OF SPRING BREAK OR OBX SUMMER CAMPS! Choose the week you want to book below as soon as possible. Because we have limited availability for the most exciting and entertaining OBX Camp! We have 11 Different Sessions throughout the Summer, Monday thru Friday 9AM to 5 PM. Most noteworthy the cost is only $250 with a $50 sibling discount and receive an additional 10% off for each additional camp session that you pre-register for, up to 20% off. Explore your creativity! Everyone will use their imagination and creative thought process to explore a variety of art mediums. Ready, Set, Play! Kids will participate in a variety of physical and mental activities. Celebrate the week with patriotic activities. Come make waves! Spend the week focusing on ocean sports and marine education topics. Learn about ocean conservation, marine life, water safety, and most importantly FUN! Based of the popular TV show, campers will spend the week competing in survivor inspired activities. We will do different arts and crafts projects. Ready, Set, Play! We will participate in a variety of physical and mental activities. Come make waves! Campers will spend the week focusing on ocean sports and marine education topics. Learn about ocean conservation, marine life, water safety, and most importantly FUN! Also based on the popular TV show, Campers will spend the week racing through countries competing in Amazing Race inspired activities. Jumpmasters is the best birthday location! There is no shortage of adrenaline-packed adventures to experience with your birthday guests. Jump on trampolines, play dodgeball, climb our bouldering wall, or tackle our ninja course! Your birthday party deserves to be awesome! Do you have daily rates? Yes. Day camp is $50.00 when spots are available. Please call the park for day camp availability. A $25.00 deposit is required at the time of booking. Receive a 5% discount when you pay in full. Absolutely! We offer $50.00 off for siblings. Are there any more discounts? Of course! Receive an additional 10% off for each additional camp session that you pre-register for up to 20% off! Week 1- $250 Week 2- $225 Week 3-11- $200 Pay for camp in full, receive an additional 5% off. Any cancellations must be made 7 days before the start of camp. Camp runs Monday- Friday from 9AM- 5PM. Do you offer care before and after camp? No. Campers may be dropped off as early as 8:55AM and must be picked up by 5PM. Do you charge a late fee for pick up? Yes. Any camper not picked up by 5:00PM will be charged a $5.00 late fee for every 5 minutes after 5:00PM the camper is not picked up. Who can can come to camp? Campers ages 5-12 are welcome to participate. Do campers need to bring their own food? 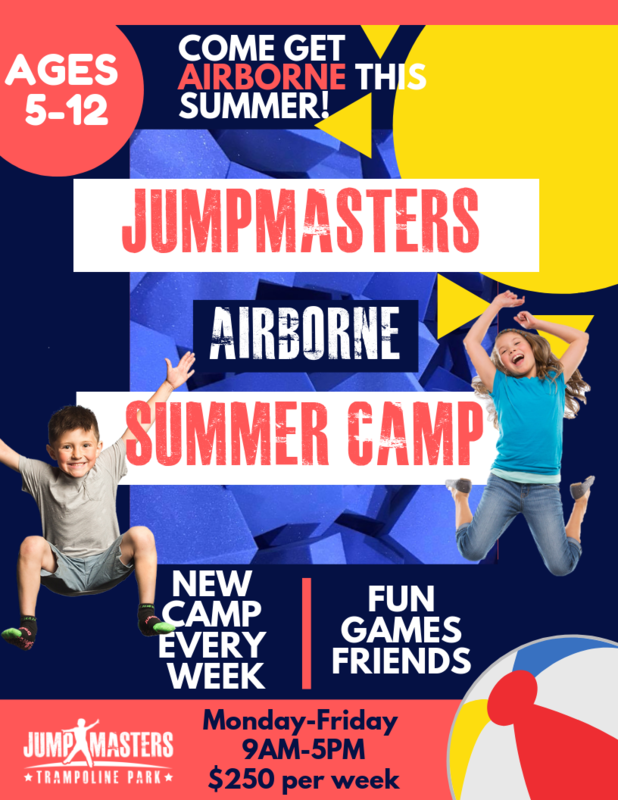 Jumpmasters will provide campers with an AM and PM snack. Campers are responsible for packing a lunch daily except for Friday. *Pizza Party every Friday! If campers have any allergies please make sure to list them on their registration form. Do we need to fill out any paperwork prior to the first day of camp? Yes. Campers must have a valid waiver on file. Waivers are good for one year from the date of signing. Waivers can be filled out by clicking the waiver tab, or the morning of at the waiver station. Registration forms can be filled out through google forms or the morning of.